You are completely capable of being booked to the brim (whatever that looks and feels like for you!) with your dreamiest dream clients. 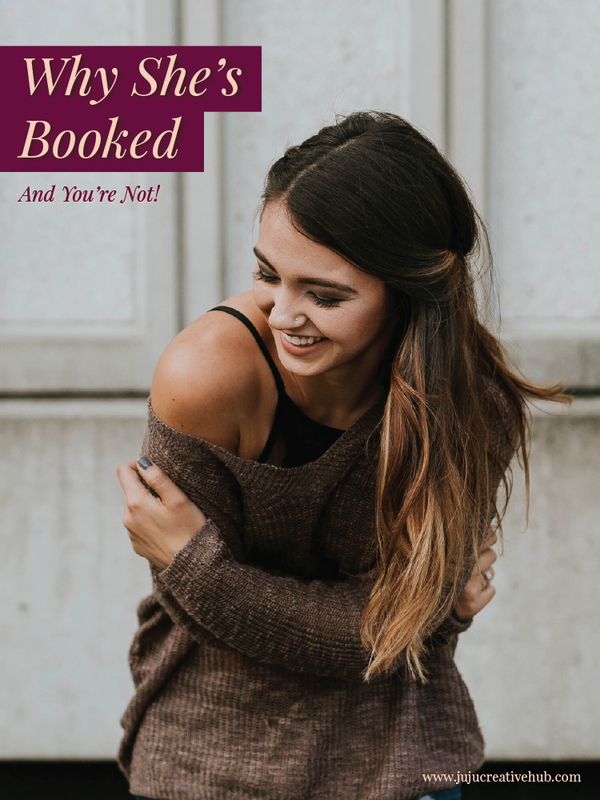 So let’s set this defeatist attitude aside for a moment, as I share with you my tips for crafting your plan to being ‘fully booked’. If you’ve been a reader of the blog for a while you’ll know that I can harp on a fair bit about identifying and finding your dream clients (like all of these blog posts for example!). Over the years however, I’ve come to realise that whilst identifying who your dream clients are is important, but that’s not the entire picture. It’s equally as important (if not more-so) to define for yourself what it means to be fully aligned with the work you do. I call it 'designing your soulful business', which I speak about in detail over here. In a nutshell it’s all about being and working in alignment. Alignment with the clients you’re attracting to your business. Working with clients should light you up, get you excited and have you dancing inside with the thought of the work you get to do alongside them. For me, this has been a constantly evolving process of defining and refining the type of woman that I’m in business to serve. Along the way I’ve worked with many types of businesses; a dentist, a university, a foot-nail technician. You could say that these businesses were less-than aligned with the work I want to do. But the sweet spot I’ve found is when I get to work with women who are creating their own business, one that has a big heart right at the centre of it. When I meet these women, I know in an instant that we’ll be a great fit. How? Because I’ve done the work in first defining and then refining the type of people I know I’m best suited to serve. And there’s absolutely nothing wrong with this type of laser-focus when it comes to attracting the right clients to your business. Alignment with the products and services that you offer. his one’s a big one for many of us. Often we wonder why people aren’t signing up for a particular package or offering. If we’re really honest with ourselves though, it’s often because we’re not fully aligned with delivering it. There’s something sitting there beneath the surface that’s causing us friction. It’s abrasive to us and our potential clients feel that too. Let me ask you a bit of an awkward question… Do you really believe in the work you do? I believe for many of us, we’ve chosen this path of creating our own business because we felt a disconnect with the standard 9-5 working for someone else. At the core of your business needs to be that fiery passion that drives you to stand up for what you believe to be true. Your business needs to align with your own core values, in order for you to create something meaningful and impactful that will change the life of at least one person. When you believe in it, they will too. I know you’ve been pouring all your energy into getting your social media numbers to rise. You’ve been insta-storying, sharing happy-snaps and uber-important memes (I mean that cat-video was a must-see, right? ), but there’s something missing. All this effort is not translating into website visitors, email sign-ups and ultimately clients!!!!! Don’t get me wrong, I believe social media is a really important tool to find and engage with your dream clients - but it’s not the whole story. It’s my belief that social media is the first-impression, but the aim of it is to get your dream clients to be interested enough to click on over to your website and find out more. Without a strategy (and I use this word loosely) to intrigue, engage and keep your dream clients coming back for more of your content on your website, social media is (dare I say it!) a little fickle. It becomes a time-waster for both you and your clients. This is where providing your dream clients great value is important. Great value comes in the form of that great blog post or video tutorial you created that speaks right to the need they’ve been struggling with. Great value comes when you are showing up in their inbox to share tips, tricks and meaningful information with them - not just when you’re on sale. Great value comes in creating an epic opt-in that makes sense to your dream clients and introduces them to your topic of expertise. I know what you’re thinking… “But Elle, I don’t know what to right for a blog post!” and “I’m too scared to send a newsletter to my email list.” Don’t worry, I’ve heard it all before, mostly in my 1:1 coaching sessions with clients. Together, we’ve worked through what’s really going on for them and created a content plan that feels aligned and doable. And guess what…. They survived sending out their newsletter, their tribe loved the content they created and their business thanked them for it. Need to start creating meaningful and valuable content for your tribe? Head on over to my blog post ‘Connecting through content’ and get inspired (there’s even a free worksheet to download at the end to help you come up with 50+ blog post ideas!). I know that those two words, ‘systems’ and ‘processes’, can have many of you running for the hills. I’ll be the first to admit, that I’m a little bit of a tech-nerd. I mean I started an entire design business not knowing how to build a website or use photoshop… that’s got to be a sign that I love to figure out technological things. But I realise that many of my clients (including you most likely) HATE this stuff. In fact, they often tell me this quite often! I’ve seen it first-hand though, that when you set up clear systems and processes in your business you are able to work with clients with more ease. It frees up the time it takes you to send out a response to client enquiries for other things in your life/biz, it makes writing blog posts and sending newsletters less of a headache, it makes on-boarding new clients and getting paid easy-peezy. Having systems and processes in your business helps you build a more sustainable, profitable and abundant business. There really is no denying that. So what sort of systems am I really talking about? Processes for writing an publishing your blog posts, sales funnels for attracting and nurturing potential clients, scripts for re-engaging past clients and navigating those hard-to-have conversations. This list can go on for ever, so I've put together a list of some tools to help you over here. When you setup systems and processes in your business, you can work smarter, using the time you have to make money and do the things you love to do. Which means you can work with as many clients as you’d like to. Plus, there really is nothing more professional than having easy processes that support your clients through the entire process of working with you. It’s my belief and personal experience that the success or failure of your business comes down to this one thing. Mindset. Even if you have all of the other business practises in place - you’re an ace digital marketer, you FB live every day, you’ve got sales funnels and systems helping you operate on almost auto-pilot - if you don’t have your mindset in check and continue to work with it then you’ll never see the success that you’re dreaming of in your business. Whenever I’ve felt that dreaded ‘slump’ in my business; you know that one where everything feels sluggish and hard, you have less clients (and less $$$ in the bank) than you’d like, I’ve taken a good hard look at what internal dialogue I’ve been playing over and over in my mind. Sure enough, I’ve been listening to the ‘self-defeat’ channel in my head - and my external world has begun to reflect that. That’s where having support in my business has really helped. I’ve reached out to my kinesiologist for a session, hopped on a call with my mastermind buddies or tapped into one of the many tools I’ve learned to call on to help me switch up my mindset and get myself back on track for attracting clients to my business. If you’re feeling like you need a little mindset shift, I’d encourage you to read my post about how to change your mindset or 3 myths that are holding you back in your business. Creating a road-map for your business doesn’t have to be all stiff business plans and spreadsheets. Instead, over the years I’ve developed some really soul-filled approaches to dreaming up big visions for your business, setting holistic goals that take in the full-picture and crafting a plan that takes you from where you are right now, to where you dream of being (aka booked up with beautiful clients!). A few things I love to bring into any business plan include a custom meditation I created to help you get out of your head and talk to your inner-sage about what lies ahead for you, crafting meaningful intentions, designing your very own 'dream dates' that keep you aligned to your future vision, setting goals with soul and implementing them on a daily, weekly and monthly basis. It’s this perfect mix of clarity and strategy that has helped myself and my clients work in the way that feels aligned, attract clients with a little more ease than before and ultimately be booked up to the capacity they so desire. So next time you look through your social media feed and begin to feel a little overwhelmed with "comparisonitis", just remember, it’s totally within your power to create a booked-out business that fills your soul! You’ve got this! If you’re looking for a little help with establishing great mindset practises, setting up systems, getting clear on your business' vision and setting some strategy around getting you there, then I’d love for you to check out my 1:1 packages. In our time together, you’ll receive customised advice that guides you to creating a business that supports you and feels in alignment.